I have never really understood the idea behind "diet" or "light" versions of food. Every lunch time at work, my co-workers would pull out a can of Pepsi Zero or Diet Coke. Personally, I do not drink soft drinks on a daily occasion just because I know it is not the healthiest of things. However, if I were to do so, I definitely would not drink the diet versions of those drinks either. To me, they have a weird aftertaste, even with the newer versions featuring other sweeteners. I have also heard reports about how lighter versions of things, such as peanut butter, can actually be worse than the original. In the case of peanut butter, light versions tend to swap out the oils and instead add extra sugar to compensate for the difference. Of course, this is not to show a bad light on these types of food, but I personally think if you really want a diet version of any food, the easiest way is to cut back the portion size. Today in our hands is the Tesoro Gram XS. 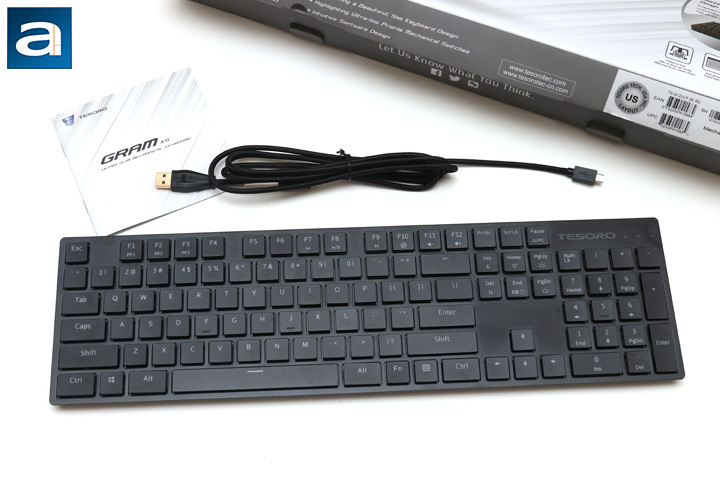 Tesoro showed this keyboard off at CES earlier this year, advertised as a super slim mechanical keyboard. I would think this is like the diet version their original Gram Spectrum, but is it any good to use? Are there any compromises made to get the body so slim? These questions and more will be considered in today's review! The Tesoro Gram XS arrived via DHL and their Express Worldwide service. I think you may have heard our laments about DHL in the past, and this time is no different. While the large brown corrugated cardboard box arrived in good condition, it was dropped off at our front door despite requiring a signature. Worse yet, when we looked at the "receiving signature" online, it showed just a blurred out photo. Clearly, DHL delivered us some fake news. Sad! 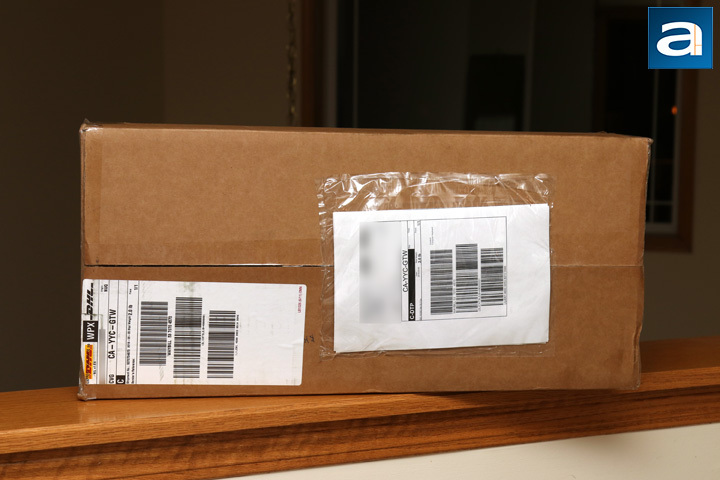 Otherwise, the box arrived from Fremont, California. Inside we have the keyboard as expected, with a layer of plastic air pockets to cushion any blows the box may have received during shipment. Pulling the Tesoro Gram XS out of the box, this retail container is similar to the most recently reviewed Tesoro Gram SE Spectrum. There are some differences, as the Gram XS is held in a white box with the keyboard displayed in the middle. 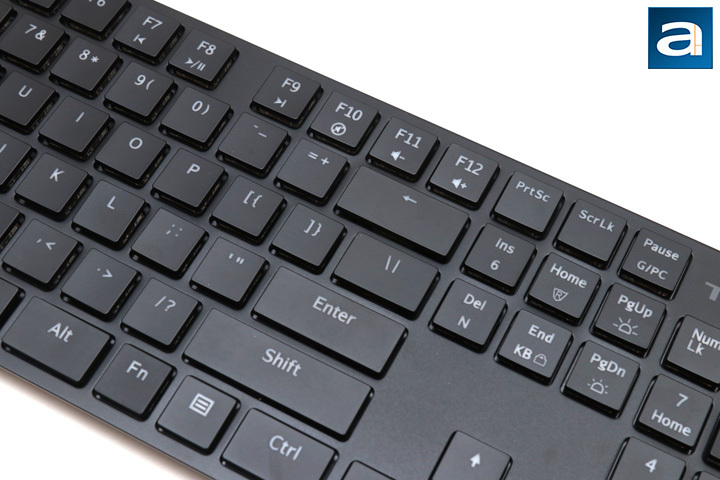 A product tag line of "Ultra Slim Mechanical Keyboard" is located right under the product name in the top left corner. On the sides and back, we have a bit more information about the keyboard, including a clearer shot of the layout, more features, and the contents of the box. From the bottom flap, you can also see this keyboard we received today is the linear red switch variant, though Tesoro also has a clicky blue switch available for this model. We will look closer at these things and more later on. Out of the box, there are not too many extras with the Tesoro Gram XS. Like the original Gram Spectrum, the Gram XS has a white version available, though we received the black one for review today. The keyboard itself is wrapped in a clear plastic bag to protect the keyboard from any scratches or dings. There is also a black braided micro USB to USB cable, measured at 1.8m long. Finally, there is a small user manual with warranty information. Warranty with Tesoro is limited to a single year, which is a bit short in my opinion. Otherwise, there is not much else to really talk about. While the original Gram Spectrum was already quite sleek when we first reviewed it, the Tesoro Gram XS we have today is downright flat. It actually makes the original Gram Spectrum look a bit thick. 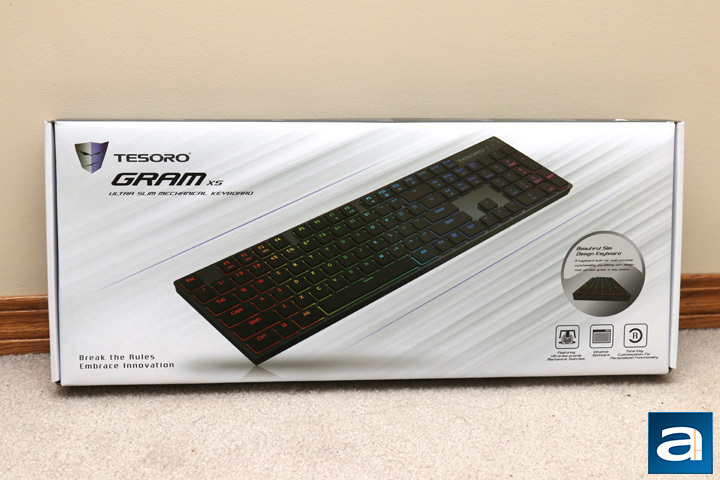 This keyboard follows in the line of Tesoro's shift to a cleaner product, especially in their Gram lineup. In fact, this is probably the first mechanical keyboard I have seen that pretty much looks like an Apple keyboard with its flat chiclet keys and metal enclosure. I personally really do not see how typing on it can be satisfying, as I really disliked the Apple implementations of their keyboards, but obviously I will approach this keyboard with a fresh mindset. In terms of style though, I do not think anyone would see this keyboard and immediately say, "Yep that is a mechanical keyboard". Its slimness is definitely the eye catcher. Otherwise, you can see similar elements have been kept, such as the exposed metal backplate. This is still a floating island-like design for the switches, though the area between each key is not hidden. Otherwise, the majority of this keyboard is black, with the exception of some dark gray text around the keyboard. Writing on the keycaps is a translucent grey. 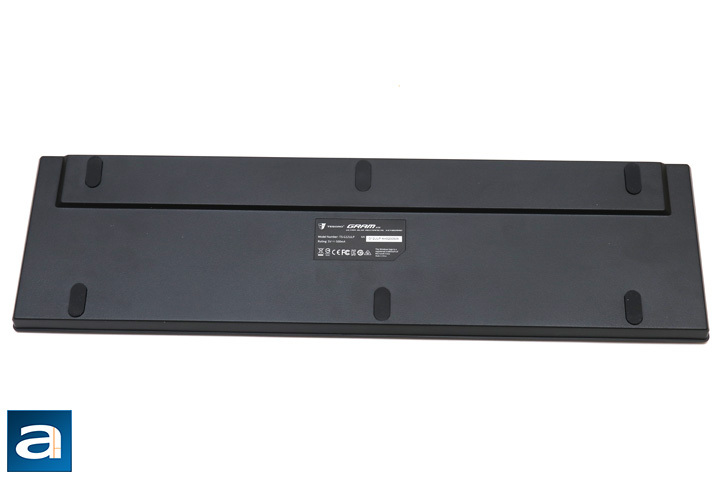 As for measurements, the keyboard is 450mm in width, 126.5mm in depth, and 23.5mm in height. While this only measures 1mm shorter than the original Gram, this XS is definitely extra slim. It is quite a bit shorter than all of the other keyboards, but there are several contributing factors. For one, the back does not get too much more elevated than the height, although it should be adequate for such a flat keyboard. This is super thin, again keeping to its XS moniker. In terms of mass, this keyboard weighs in at 800g including the cable. In terms of build quality, despite its very thin profile, the Tesoro Gram XS is quite well built. There is a very slight amount of flex on the body, but there is no give in the switches past bottoming out. This is also helped by the fact both the backplate and the enclosure itself is metal. There is no wrist rest included with the Gram XS, though I am fine with this exclusion considering how flat the keyboard is. 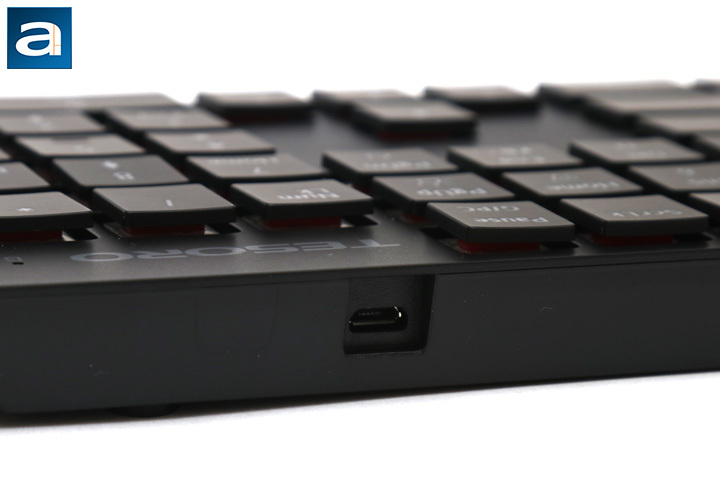 The Tesoro Gram XS came to us with a standard 104-key QWERTY ANSI layout. This is pretty normal and is practically the same as every other keyboard APH Networks has reviewed recently. However, if you do look closer, you will notice the bottom row is a bit differently sized, with the Fn and Menu key being a regular key size, while the Alt key on both sides are larger. Three small blue LED indicators exist on the top right hand side beside the Tesoro logo. The first one is marked by a G, indicating when the keyboard is in gaming mode. In this mode, the Windows key is disabled and your macros are available here. The next two LEDs are for Num and Caps lock, respectively. It seems more and more manufacturers are dropping the Scroll lock indicator, as less people are using it. Otherwise, I think it would have been nice to see a tenkeyless form factor for this keyboard, especially as slim is the name of the game here. As for secondary functions, the Tesoro Gram XS has quite a few. These can all be activated by pressing the Fn key prior to pressing the secondary function key. F1 to F3 are the shortcuts to jump between the three gaming profiles. These profiles are where macros can be saved and activated in. F7 to F9 are media controls, including Previous Track, Play/Pause, and Next Track. Finally F10 to F12 are made for volume controls, including Mute, Volume Down, and Volume Up. 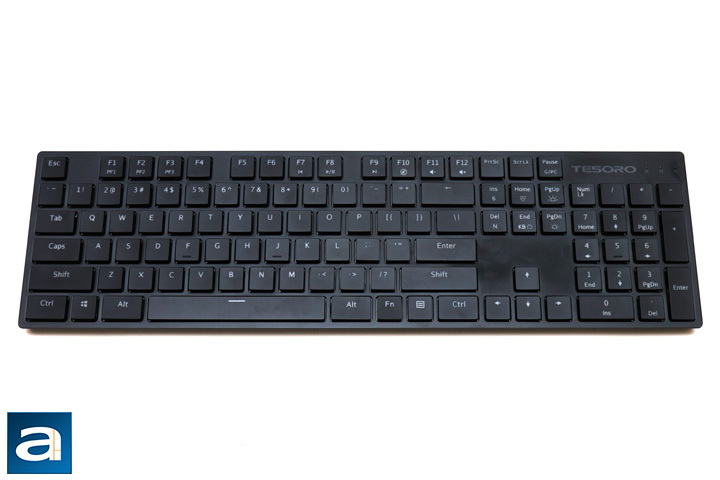 There are a few more function keys, including Insert and Delete, which are used for switching between 6 and N key rollover. Home key allows you to quickly start recording macros, and the End key is used to lock all of the keys on the keyboard. Page Up and Page Down are used to increase or decrease the brightness of the backlighting, which will be covered in detail later on in the review. Finally, Pause switches gaming mode on and off. As for key rollover, the Tesoro Gram XS offers NKRO over USB. NKRO is abbreviated for n-key rollover, which refers to the number of keys independently scanned by the hardware. In essence, this fixes ghosting issues found in cheaper and/or laptop keyboards. While ghosting is a marketing term, there are cases where keyboards will not be able to recognize more than one keystroke at a time, causing for missed keys. This can be frustrating when you are playing games, or even if you are just a very fast typist. On an aside, the original usage of ghosting in keyboards actually referred to a third key being registered when two other keys were pressed, which thankfully is not a problem with most modern keyboards. Before continuing on, one of the main selling points of the Tesoro Gram XS is the mechanical key switches. There are three main types of keyboards in the market today. The cheapest but most common is the membrane keyboard, which is the easiest to make, but also has poor typing feel and response due to squishy keys. Next is a scissor switch keyboard. 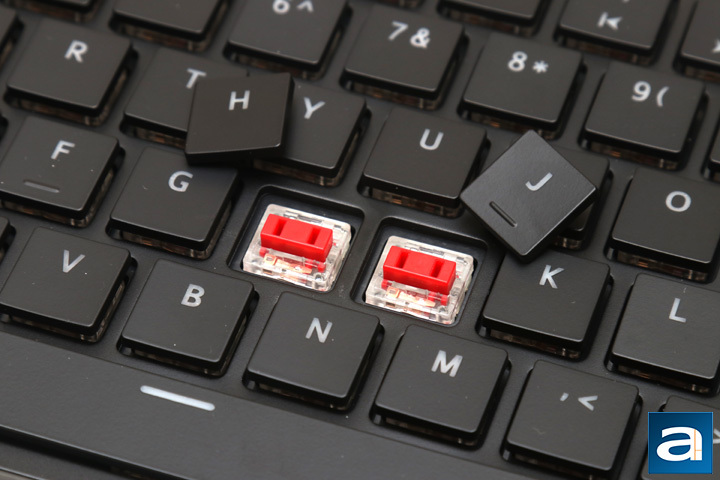 This can be thought of as an enhanced rubber dome with two extra interlocking plastic pieces connected to the key and the keyboard. This creates a better tactile response and typing experience in comparison to the aforementioned membrane. Mechanical keyboards, such as the Gram XS, cost the most, because each key switch is an independent part. These switches are generally composed of a base, stem, and spring, with varying degrees of tactile and audible feedback. Our unit of the Tesoro Gram XS features red mechanical switches. A closer inspection reveals these are made by TTC. Unfortunately, these are rated to last only up to twenty million keystrokes, which is significantly less than the typical fifty million. Red switches are what I would call a gamer switch, as they feature a quiet typing experience and a relatively low actuation force to trigger them. The red switch also feature a low resistance to typing with a linear travel. Specifically to this slim TTC red switch, we have a travel distance of 3mm, actuation distance of 1.1mm, and actuation force of 45g required. I have not had great impressions of TTC switches in the past, but we will see what they are like to use later on. As you can see here, the keycaps on the Tesoro Gram XS have a much thinner profile. They are actually remind me quite a bit of the keys on a laptop. The keycaps are very thin with ABS plastic construction and feel quite cheap. While it makes sense to keep this keyboard as slender as possible, I do not think they should be skimping out on materials for things like the keycap. From this shot, you can also see the slight gap between the keycaps and the rest of the body. This should hopefully allow for the LEDs in the Gram XS to shine brighter and make for a nice effect. Finally, from this angle, you can see the back plug, which is a micro USB connection. It would have been nice to see a USB Type-C connection, as a few of the more recent keyboards have this durable plug. The cable accompanying the Tesoro Gram XS is a black one, measuring 1.8m in length. It would have been nice to see a wireless version of this keyboard, especially with how slim the Gram XS is as a whole. Otherwise, there is no additional USB ports or audio connections, though I have never really found them useful before. From underneath the Tesoro Gram XS, you can see there is only one surprise that I see. In the four corners and in the middle of the keyboard, we find oval shaped rubber grips holding the keyboard in place. However, there are no kick stands to change the height of the Gram XS. I personally would have liked to see some adjusting capabilities with height, but it is not present here. On the other hand, considering how flat this keyboard is, it may not make a whole lot of sense to force your wrist to tilt anymore. Otherwise, the traction pads keep this keyboard in place from moving about while placed on your desk. Plugging the Tesoro Gram XS into my computer, the first thing I realize is how modern the keyboard looks. With its sleek and flat finish, it really looks a lot more minimal than any of the other peripherals I have had before. Aesthetics aside, using the Gram XS was not as enjoyable as I would have liked. While I expect a flatter switch to have less travel distance and also require less actuation force, I often found keys to be activated despite me just resting my fingers on them. Obviously, this point is more variable from user to user. However, I also found the switches to be inconsistent in their feedback, with some keys feeling softer and possessing a mushy effect when bottoming out. This really muddied the linear feel I would have expected. Unlike the other flat keyboard I have used, the GAMDIAS Hermes M3 RGB, which featured Kailh switches, these TTC switches feel practically like membrane switches in both its response and bottoming out. In fact, this was one of the first keyboards I have reviewed where I did not use to write this review. When it came to gaming, the speed and short travel distance of these TTC Reds was good. Playing games like Overwatch or League of Legends was neither hindered nor aided by this keyboard, though there was again some accidental actuation of keys in my testing. All in all, I think the switch is an acquired taste and, in my opinion, a big letdown of the otherwise sleek and clean Tesoro Gram XS. As for the lighting, I really like the vibrancy of these RGB lights. Upon plugging the keyboard in, you can immediately see the rainbow wave flowing across the keyboard. You can change the lighting effects using the software. This includes reactive effects such as trigger, ripple, firework, or more standard effects like a static light, breathing, spiral pattern, color cycling, or a random illumination. For most of these effects, you can pick what color and areas of the keyboard to apply the effects to. You can finally make other changes including the speed of certain effects. Otherwise, you can see the colors on the keyboard are quite bright, as they bleed out the sides of the keycaps, making for a really nice effect. The colors are also accurate compared to what we see in the utility. If there is one place I have lamented about on Tesoro, it is their software experience. While it has always been functionally capable, it has either been a mess in terms of design or littered with bugs. With the Gram XS, Tesoro is rolling out a new utility called Tesoro 360, which is designed to be a single solution for all of their upcoming products in addition to the Gram XS. Immediately, it looks much cleaner. When you first install the software, you will be greeted with an option to select your product. For the Gram XS, there are two pages, though I have only showed one. The first page we have is the assignment page, which allows you to set up macros for the keyboard. The lighting effects page is what you see above, which again allows you to change the settings for lighting. Three profiles are available to save your settings to. In addition, this software can check for firmware updates if need be. I did still run into an issue later on, as I could not launch the software anymore, though I think Tesoro is definitely still working out the bugs, as they pulled down the ability to download their software now. I think they are now on the right track, and hopefully they will continue this trend towards a simpler experience. When we see the svelte Tesoro Gram XS and after using it several times, I have to say Tesoro has done something really neat with their keyboard, although some problems arise in keeping this keyboard so lean. For one, the design of the keyboard is really eye catching, especially when you compare it to other mechanical ones. 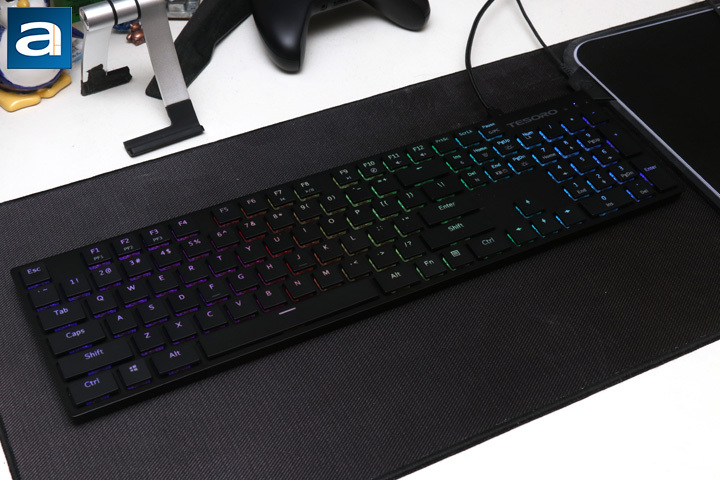 In addition, this keyboard comes with all the standard features such as N-key rollover, media controls, macro recording, and RGB lighting. 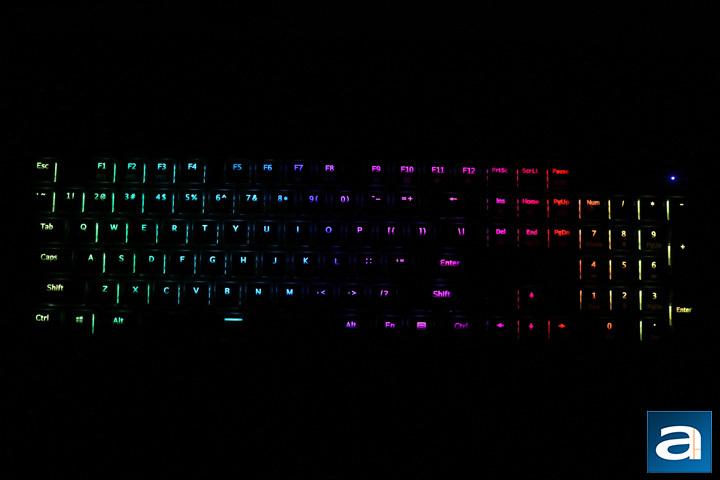 Speaking of the lighting, due to its design, the RGB magic is really unique here, with light bouncing out at the sides and through the keycaps to make for a really vibrant look. 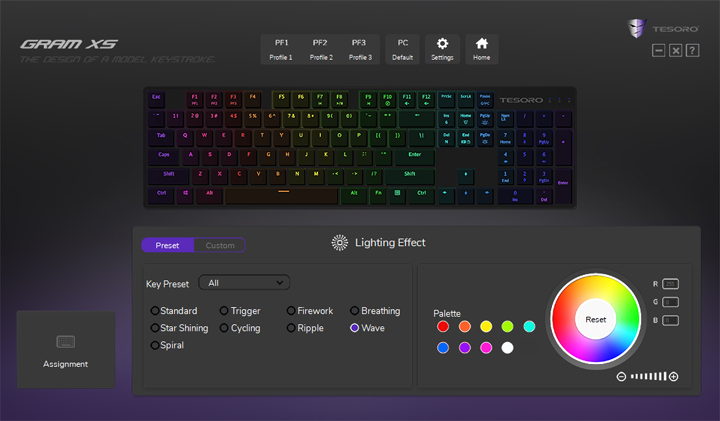 Finally, Tesoro has hit the right mark for its software utility, as Tesoro 360 is a simple but capable application to help with customizing the keyboard. It still has some kinks to work out, but it is miles better than what we have seen in the past. However, just like all the diet foods we mentioned in the introduction, there are some growing shrinking pains when we talk about the Gram XS. Because of its slimness, sacrifices have been made in both the keycaps and switches. The keycaps feel cheap due to its thin construction. However, my biggest qualm is with the switches. Inconsistency and an overall spongy feel plague these linear TTC Red switches. I do not see why the Gram XS could not use the same slim Kailh switches we saw on competing products, as they are far superior in terms of providing a consistent feedback. In addition, the switches' relatively short lifespan combined with the relatively short warranty coverage is yet another nail in the coffin. Unfortunately, as the purpose of the keyboard is about how it is like to type on it, it really makes the Gram XS a viable sell. At an MSRP of $120 USD, the Tesoro Gram XS is competitively priced in terms of its feature set, but its implementation is in need of some key fixes. Tesoro provided this product to APH Networks for the purpose of evaluation. 6/10 means A product with its advantages, but drawbacks should not be ignored before purchasing. 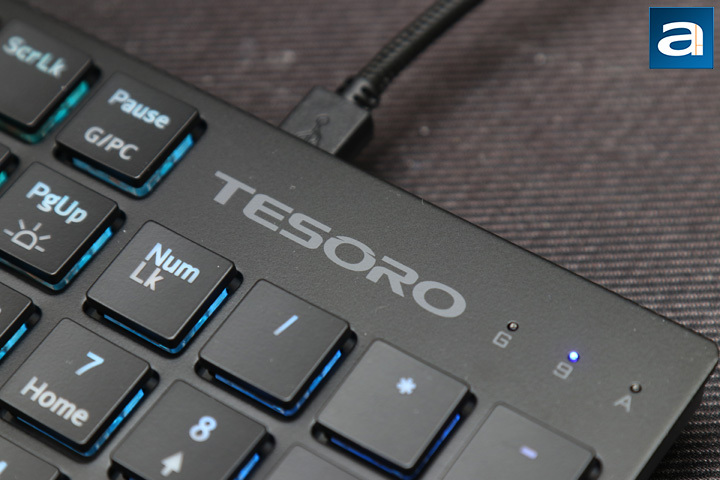 The Tesoro Gram XS is a situation of two steps forward and one step back, with improvements in their software and solid build being let down by its mechanical switches. Do you have any comments or questions about the Tesoro Gram XS? Drop by our Forums. Registration is free, and it only takes a minute!